Today was a great day and full of activity! We went to church then for lunch we went to Louie's. We had never been there until today, but we received a gift card and we really enjoyed our lunch. We took the girls to TCC to see Fletcher. Maddie can't go into his unit so we took him to a family room. Fletcher's PT worked on his wheelchair on Friday and came up with a great solution, she laid the seat down with a gel type pillow and we laid him on top of it. He stayed in his wheelchair for about an hour and a half with no problems! 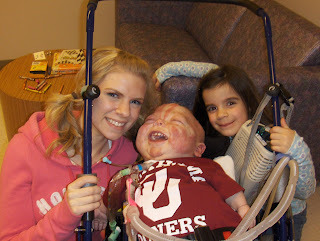 Fletcher really enjoyed seeing his sisters today. They laughed and giggled the whole time. 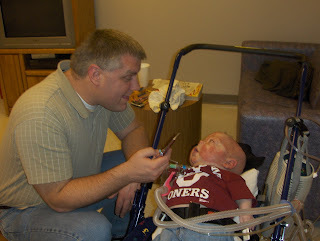 We then had a birthday party to go to for my nephew Gabe. It was a bowling party and we all had so much fun. Craig and Maddie bowled, Kayleigh and I watched and cheered them on! Craig did pretty well on his first game and Maddie well...I have NEVER seen a bowling ball roll so slowly in my entire life! 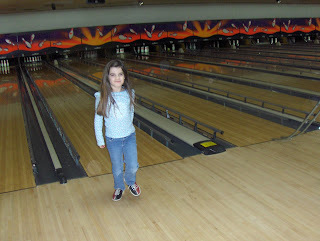 She was so serious and really wanted to knock those pins down but that ball barely made it to where the pins were! It was hilarious! Maddie waiting on the slowest ball in the world! 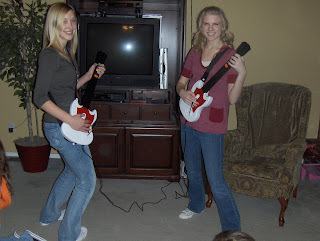 We are now home and Craig and Kayleigh are playing Guitar Hero and Maddie is driving them crazy! Fun night at the Burns' home! As you all know things have been crazy around here with Fletcher, but some fun things have been happening also. On January 6th Kayleigh turned 14. Happy Birthday, Sis! You are wonderful and I'm so grateful to be your mom. You are sweet, kind and very funny! I love you very much! Kayleigh had a small slumber party with two of her cousins, Megan and Devon and Kayleigh's new BFF Vanessa. 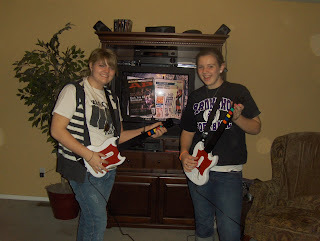 They played Guitar Hero, ate lots of junk food and stayed up way too late! But fun was had by all. Her party was the night Fletcher went into the hospital so Craig's mom took the reigns and made the party happen. 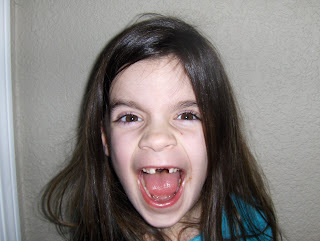 Maddie lost her third tooth. It looks like she has lost two teeth but it's just one tooth! She also got her ears pierced, something I've been trying to talk her into for two years now! She just decided one day that she wanted her ears pierced and I quickly took her up on it! That's all for now. Thanks for stopping by! How encouraging for you and yours to have such a good day. I am thrilled for you to have giggles and smiles and fun. You are amazing and God is big! Thanks for sharing both the hard and the good. What a blessed day! Smiles, smiles everywhere! Toothless smiles like Maddie's are some of my favorites...Love to you all! I keep trying to talk my little girl into earrings too, but so far she's not having it. 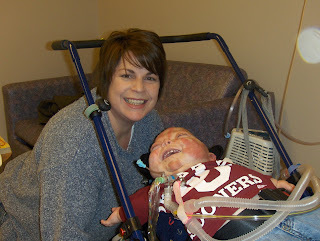 You have been much on my mind today and I'm hoping today was anther good one for Fletcher. haha awesome picture of maddie! how hilarious! Hey is there a good time that I could come visit you and fletcher at TCC. you can e-mail me and let me know when if I could come see you guys! 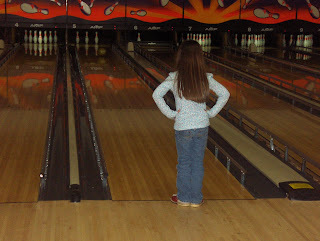 Love the pic of Maddie watching the bowling ball with her hands on her hips! That makes me laugh!!!! !